Marijn Kremers has a busy 2018 season in prospect just after turning 20 years old. The Dutchman has embarked on a difficult challenge of simultaneously engaging on two fronts, in KZ and OK! 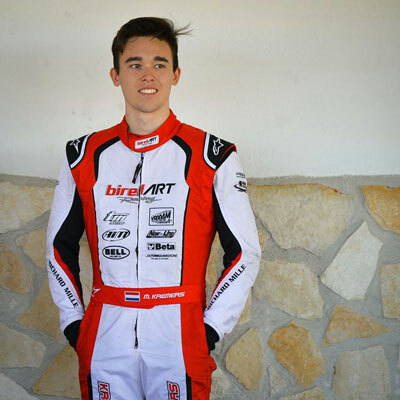 Marijn talks about his new goals, which he shares with the factory Birel ART Racing team. MARIJN, HOW DID YOU GET STARTED IN KARTING? My father bought a Baby-Kart when I was four years old! I was already having a lot of fun and I started racing a little before my seventh birthday in Mini in the Netherlands. I then raced in Cadet and Rotax Mini Max, before starting to enter international races. In 2011, I raced for my country in the CIK-FIA Academy Trophy. At the last meeting at Sarno, I won Race 1 and Charles Leclerc Race 2! Overall, I finished 7th. WHEN DID YOU START OFF IN 125CC GEARBOX? In 2013, after two years in KF3. The move to KZ2 was a big step! It was a good education however, because the category is very big, you have to fight constantly just to get into the Final. In 2017, I felt ready for KZ, a choice I have not regretted. In 2017, during the first round of the CIK-FIA European Championship in KZ at Genk. The Belgian circuit is only one hour from home, I raced in front of my family and friends. I finished 2nd in the Final just behind Paolo De Conto. I was so close to the win! In the end, I finished 3rd in the European Championship and 6th in the World Championship. I was very happy with my first season in KZ and that the Genk circuit has been chosen for the KZ World Championship this year. It will be very special for me. For me, it was not really a surprise. I have known Felice Tiene for a long time, we have often raced against each other and I knew I was able to beat him. Finally, I had a good feeling with the team and my Birel ART / TM Racing equipment, I had already gained good experience of the international races and I managed to score better results than Felice. AT THE KZ WORLD CHAMPIONSHIP IN WACKERSDORF, YOU ALSO TEAMED UP WITH RONNIE QUINTARELLI. DO HAVE GOOD MEMORIES? Yes, it was very interesting to talk to him. He told me a few anecdotes about his career in karting which goes back more than 15 years, and what he found changed today. He explained to me how he had prepared to perform against the best drivers in KZ. IN 2018, YOU CHOSE TO RACE IN BOTH KZ AND OK. IS NOT IT TOO DIFFICULT TO GO FROM ONE KART TO ANOTHER? No, I learned to adapt quickly to the constraints of these two types of equipment. In 2016, I had the opportunity to participate in the Australian Championship in two categories: X30 and KZ2. I moved from one kart to another in the space of an hour, it was an excellent learning experience. Today, it is not a problem for me to race one weekend in OK and another in KZ. AT THE FRONT, THE DRIVERS ARE VERY CLOSE TO EACH OTHER, HOW DO YOU MAKE A DIFFERENCE? Over the years, I have accumulated a lot of experience and it becomes easier to react when the situation gets complicated. In recent years, I have raced very consistently at the front, I managed to get on the podium several times and all this gives me much more confidence in myself. In addition, I feel good at Birel ART Racing. Davide Forè, our new team manager, is very motivated and he constantly pushes the entire team to do their best. YOU HAVE TO BEAT VERY YOUNG DRIVERS IN OK AND DRIVERS OF GREAT TALENT LIKE ARDIGO OR DE CONTO IN KZ. HOW DO YOU HANDLE THIS SITUATION? In any situation, every race, my goal is the same: to fight for the wins, regardless of the drivers. But I admit that I prefer the KZ field. Drivers are more experienced and they do not do anything silly on the track. There is a certain respect between us. In OK, they are much more fiery, overtaking does not happen in the same way! For now, I feel very good in karting. Car racing requires a big budget and I think it is not wise to try the experiment in unfavourable conditions. I have the chance to race at the top of international karting and the standard is incredible. Being a karting professional is already a great challenge.